If you haven’t been at the Florence County Fair in Recent Years. . .
. . .you just may be surprised at what we have accomplished and what we have to offer you! The 2018 Florence County Fair marks the 115th annual anniversary celebration of our family-friendly tradition. While many items and activities have changed throughout the last 115 years, one very important item has not changed. The Florence County Fair is a celebration of the many and varied talents of our Florence County residents as well as well as serving as a showcase of our County’s agricultural and natural resources. In 2018, we have added multiple new contests and activities, such as the Kids Incredible Superhero Tea Party, and special Comic Book exhibits. In 2018, we also see the return of our crowd favorite events including: the Mud Bog, the U.P. 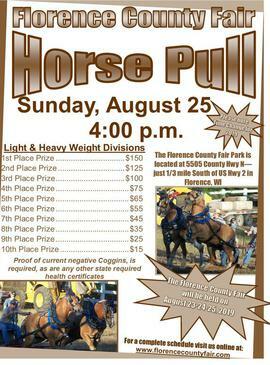 Garden Tractor Pullers Pull on Friday night, and the Horse Pull on Sunday, and that is just to name a few of the returning favorites. As we make plans for events and activities at the fair, we are constantly trying to keep our costs low. And we have continued to do just that. Admission to the Florence County Fair will be free for children ages 12 & under. There will be an admission fee for people ages 13 and older of $5, which is good for the entire three days of the fair. There is no charge for parking at the Florence County Fair Park; however, space is limited. Parking will be restricted on County N near the two entry gates to provide visibility for vehicles entering and exiting the fairgrounds. These restricted areas will be marked with ‘no parking’ signs. If the Fair Park parking areas are full, you may park elsewhere and walk in to the fairgrounds. Once you are at the fair, most of the entertainment and activities are free to watch and participate in. The complete schedule of events takes almost 2 entire pages of this newsletter! 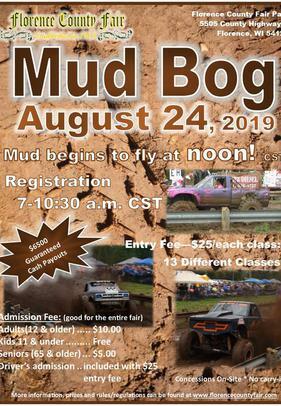 Out of all those activities, there are only three which require an additional entry fee for you to participate in—the Mud Bog, the Speed Horse Show, and the Classic Car and Motorcycle Show. These events are free for the general public to watch, so the only additional costs are the entry fees for the events. All of our music, old-fashioned kids games, kids Coin Scramble, exhibits, Magic Show and Air-Powered Rocket Workshop, horse pull, Grandma’s Garden, cricket spitting contest, plus many MANY more activities are all free to attend and participate in. during the fair. In addition to admission, the fair also operates Lydia’s Kitchen and the Beer Stand during the fair to provide food and beverages to attendees while earning additional money to put towards the fair activities and expenses. Our goal is to keep our 115th Annual County tradition a family-friendly event affordable for everyone who is attending. We hope to see you there! We often hear "I would help at the fair, but no one asks me to help." The truth is we don't always know who would like to help at the fair. Here's your chance to volunteer and let us know. Are you interested in volunteering some time at the 2018 Florence County Fair? All volunteers will receive an admission pass to the fair. Volunteers who work more than one shift will also receive a meal pass. 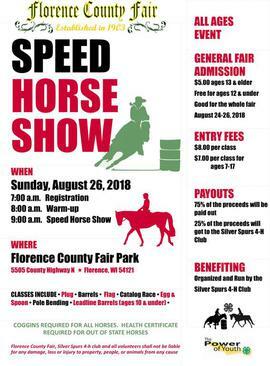 Sunday, August 26, 2018 - 9:00 a.m.
Special Exhibit Contest Entries may be brought to the Florence County Fair Park Exhibit Building during this time...all special contest entries must be delivered by noon. Please note that the Florence County Fair will be taking photographs and video during this event which maybe used for future marketing purposes. If you have questions regarding the fair, please let us know. . .
You can call or text the Fair Office at 906-282-9153. 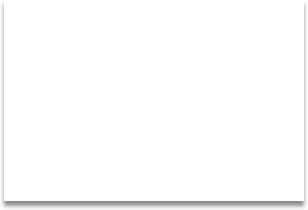 Sunday, August 26, 2018 - 3:00 p.m.
We want to hear from you! 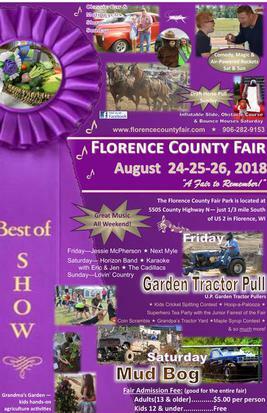 Tell us what you think about the 2018 Florence County Fair. What did you like? What would you like to see changed? Do you have other ideas? 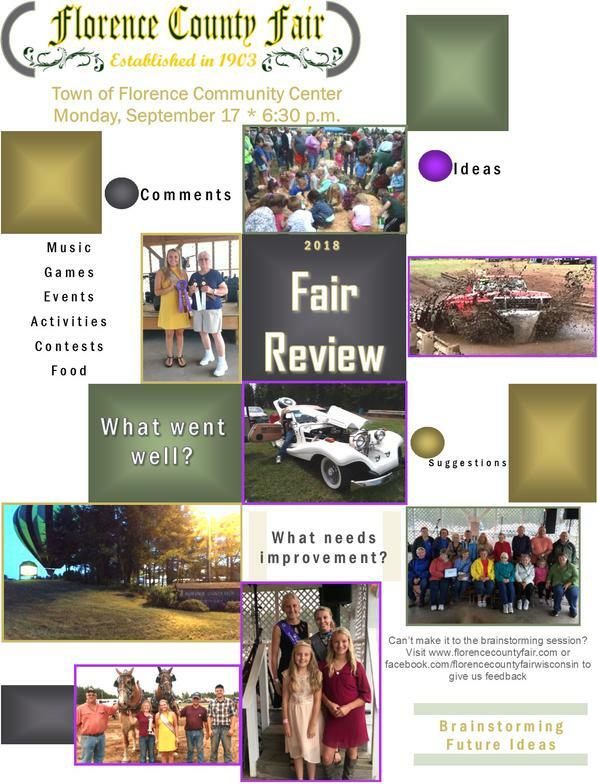 Click the link below and fill out an online survey, or make plans to attend "A Fair in Review" on Monday, September 17, 2018 at 6:30 p.m. at the Town of Florence Community Center.